YouTube trying out video downloads? If you’ve ever enjoyed a YouTube video and then thought “I want to take this with me wherever I go”, then prepare to be mildly pleased. YouTube appears to be experimenting with offering downloads of videos. 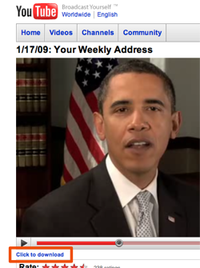 The first to gain this feature have been the videos on Obama’s ChangeDotGov YouTube channel. The videos come in a decent format – MPEG4, using the H.264 codec. That’s the same as the same videos that you get on the iPhone portal. The capability to download video has been offered by competing sites like Vimeo for ages, but YouTube has avoided it – presumably to quieten the intellectual property issues involved, though anyone can download YouTube videos with a simple Google search. It’s likely that content owners will soon see an option as to whether to allow downloads of their videos or not. I hope that many do, and that those who don’t begin to feel the pressure to allow it. Just don’t expect to be able to download a million music videos tomorrow. The BBC has been blowing your license fee on further developing its iPlayer service, announcing today that it’s starting to use the open source H.264 codec for its streaming telly service. Adobe has announced that its popular Flash Player 9, codenamed “Moviestar”, is being updated to include the H.264 / MPEG4 standard video format. This, together with technologies including High Efficiency AAC (HE-AAC) audio support and hardware accelerated, multi-core enhanced full screen video playback, could lead the way to Flash Player being used for high definition content. It could also have implications for how popular video sharing services such as YouTube and MySpace operate, although YouTube is already moving to the H.264 format used by Quicktime so that videos can be played back on the iPhone, which currently doesn’t have Flash support.